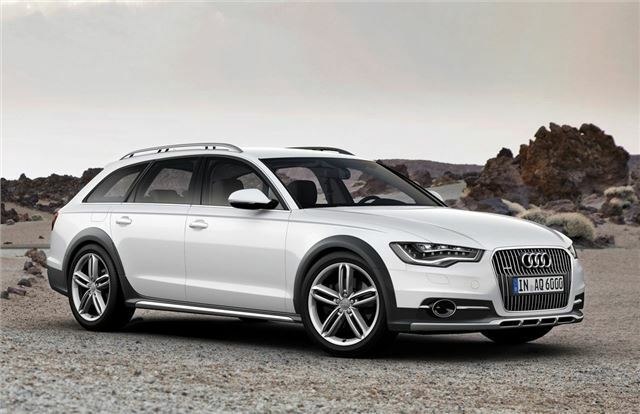 The new Audi A6 Allroad goes on sale in February with prices starting at £43,145 for the third generation of the off-road version of the A6 Avant. The new model features a new four-level adaptive air suspension system and is available with three engines - all 3.0-litre units. To mark this out as the 'tougher' A6, the allroad gets extended side sills, flared wings and vertical slats in the grille. There are also stainless steel underbody guards at the front and back while the rear exhaust pipes have a new flattened design. As is now an allroad tradition, the wheel arches, bumpers and sills are painted in a contrasting colour, but can be body-coloured if the optional aluminium exterior package is specified. Java Brown paint is available exclusively for the new A6 allroad. Thanks to the extensive use of aluminium components, the new A6 Allroad is 70kg lighter than the outgoing model which helps economy and handling. There is one petrol engine - a 3.0 TFSI with 310PS - but most owners will go for the 3.0 TDI. There are two versions of this producing 204PS and 245PS. The entry-level version averages a claimed 46.3mpg with 159g/km of CO2. All three engines are paired with the seven-speed S tronic dual-clutch transmission which is available with optional paddles on the steering wheel. The quattro permanent four-wheel drive system also gets torque vectoring. During dynamic driving this system brakes the wheels on the inside of a bend, before they start to skid, to enhance traction and handling. The optional sport differential distributes the power in continuously variable proportions between the rear wheels. The adaptive air suspension, which combines air suspension with controlled damping, comes as standard. It lowers the body by 15mm at high speed and raises it by 35mm at the push of a button. The driver can also select a lift mode at low speeds which gives an extra 10mm for really rough roads. A hill descent assist function for steep downhill terrain is also included. This limits the speed to between 6mph and 12mph, depending on the surface.